I think I am going to keep posting lists in this section, as lists are useful. To paraphrase Umberto Eco, one faces infinity and the incomprehensible just better with them. 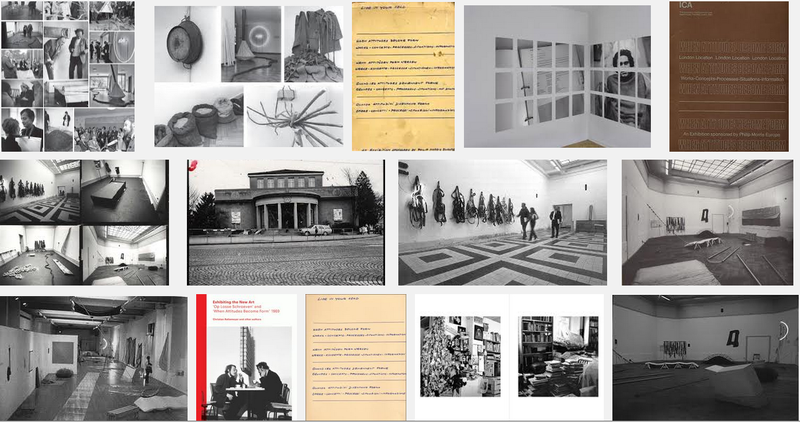 With everything on offer at the Venice Biennale preview next week, a list could certainly be a handy thing. We will all be slogging in the hotness and slowness of the island for a couple of days, facing a deluge of art, openings, parties and lunches, desperately trying to make our way through a city packed with everyone in the art world we love, and hate. The curated section of the Biennale, and Pavilions in the Giardini are obvious destinations, so my list includes some other pavilions, exhibitions and people, in no particular order, that I am excited about. Akram Zaatari, Still from On Photography, People and Modern Times, 2010. Two-channel synchronized HD projection (color, sound), 38:43 min. A new work by Zaatari, intriguingly described as a ‘space of encounter where strangers from different worlds find themselves on stage face-to-face’, is also intended as a critique of the notion of national representation. The pavilion seems to centre around a secretive story, with promise of an element of surprise at the launch of the pavilion. Two brilliant curators at the helm. More info. 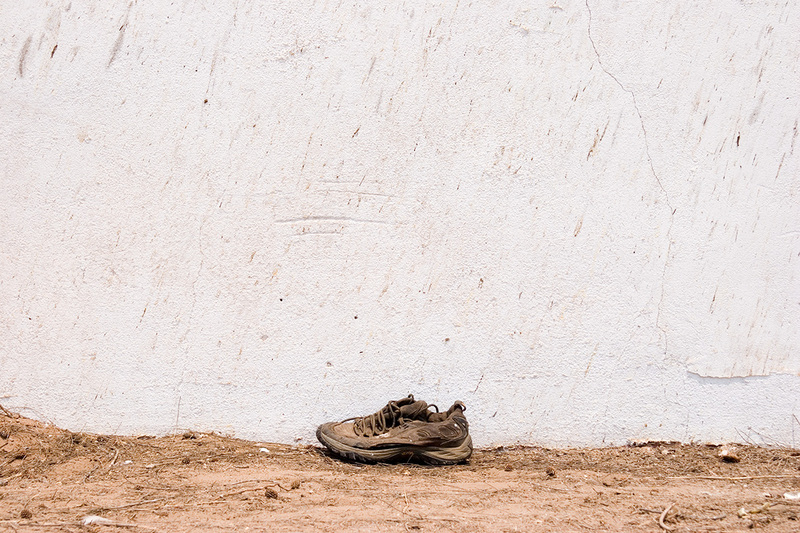 Edson Chagas, from the series ‘Found Not Taken’. I kept on having to do a double take, confusing the Angolan participation at the Art Biennale this year with the 2012 contribution to the Architecture Biennale. The latter was titled ‘Beyond Entropy Angola’. Until I figured out that the same curators (Paula Nascimento, Stefano Rabolli Pansera aka ‘Beyond Entropy’) are behind both. Double whammy. From their website, ‘Beyond Entropy is a research-based studio practicing architecture, urbanism and cultural analysis. Beyond Entropy uses the concept of energy as a tool to conceive new forms of architecture beyond the rhetoric of sustainability.’ So perhaps the pavilion is a continuation of the conversations started last year. I wonder how my Angolan artist friends feel about this? Interesting none-the-less. More info. The Mexican Pavilion is now permanently located in the former church of San Lorenzo in the Castello. Closed for about a century, and brought back to life through extensive restoration by Mexico started for the 2012 Architecture Biennale, the impressive building will house a monumental site-specific sound sculpture by Ariel Guzik and is a response to the extraordinary acoustics and spatial arrangement of the building. More info. 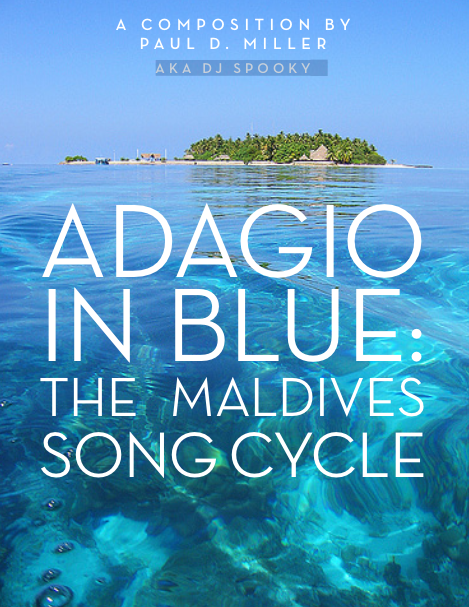 The art collective Chamber of Public Secrets (CPS) is responsible for the first Maldivian Pavilion in Venice. It is intended as a platform for environmental campaigners, artists and thinkers to bring attention to the plight of the low lying island nation, and the looming crisis of rising sea levels due to climate change. The pavilion has been set up as a charged conversation between aesthetics and activism. Contributions include a new sound work/composition to premier at the vernissage by Paul Miller (aka DJ Spooky), various interventions by Thierry Geoffrey (aka Colonel) and a collaboration by Khaled Hafez and Wael Darwesh amongst numerous others. More info. The biannual exhibition at the Palazzo Fortuny functions as a massive billboard for Belgian designer and dealer Axel Verwoordt and his exquisite taste. However the shows are always a must visit, and in the past offered fantastical combinations of antiques, objects and artworks from a vast time period. The rickety and rambling Palazzo itself is magical. This year’s show is focused on the practice of the recently deceased Catalan artist Antoni Tàpies and his personal collection, which includes works by Joan Miró, Pablo Picasso, Kazuo Shiraga, Franz Kline, Jackson Pollock and Jannis Kounellis, but also a selection of ‘oriental’ and ‘tribal’ sculptures. In addition the curators selected complimentary works by Perejaume Borrell, Anthony Caro, Marisa Merz, Giuseppe Penone, Kichizaemon Raku, Shiro Tsujimura and Gunther Uecker. More info. Ok, all our friends will be there, or be part of the show, and at the opening we will forget our gripes for a while and get tipsy and feel all patriotic. Here is for trusting it is an important and brilliant show. 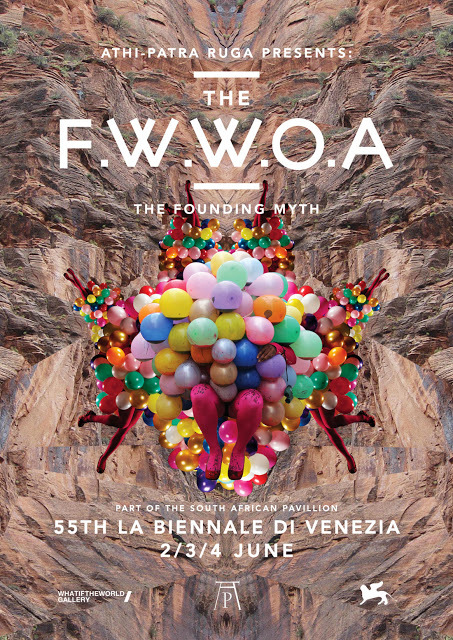 Some unfortunate scheduling however will mean that Athi-Patra Ruga’s much anticipated and expanded procession performance, ‘The Future White Women of Azania’ takes place after I (and many others) leave Venice, on 2,3 & 4 June. More info. Bisi Silva will serve on the International Jury of the 55th Venice Biennale, which is absolutely brilliant news. 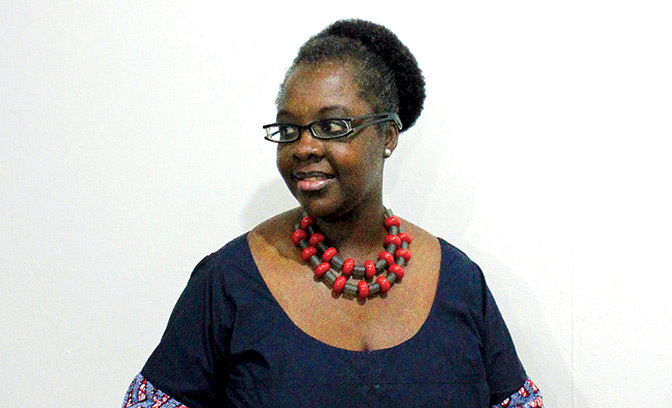 I have huge respect for Silva’s tireless (and often thankless) work at the helm of the Centre for Contemporary Art in Lagos, Nigeria, and her incredible energy in promoting contemporary art from the continent. Her work on an increasing number of international platforms over the years has raised the profile of the CCA, and leading to interesting and valuable collaborations accross borders. Lets see her impact on the committee! 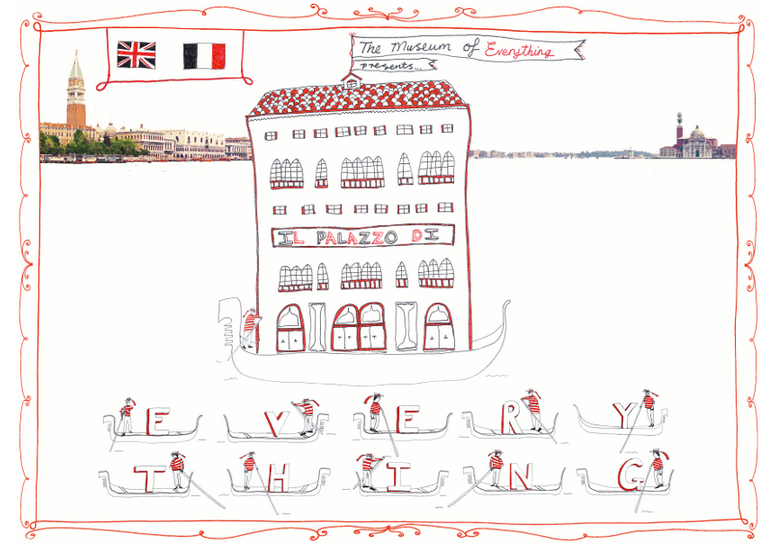 So, the incredibly quirky Museum of Everything, ‘Britain’s first and only museum for the untrained, unknown and unintentional creators of our modern world’ is setting up on the lawns next to the Giardini. Under the banner “Il Palazzo di Everything” (nudge nudge wink wink), they will also set up a Salon of Everything, where you can catch daily conversations by artworld luminaries, many spontaneously arranged. There is also an invitation to sprawl naked in the sun on the grass at the Cafe of Everything. Their exhibition will focus on the work of Carlo Zinelli. Watch their charming info video here. 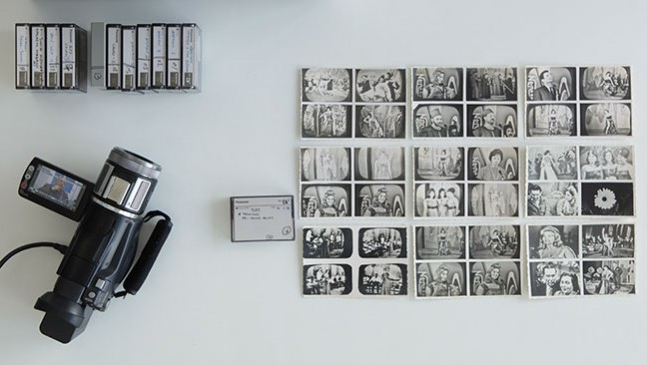 The Prada Foundation is presenting ‘When Attitudes Become Form: Bern 1969/Venice 2013’, a reconstruction of the seminal 1969 exhibition ‘Live in Your Head: When Attitudes Become Form’ by Swiss über-curator Harald Zeemann. At the helm is Germano Celant with assistance from heavy hitters Rem Koolhaas and Thomas Demand. Its not a particularly novel premise to return to the show, as it has spawned numerous reflections, interpretations and homages, including ‘Live in Your Head’ which I saw at the Whitechapel in London in 2000. 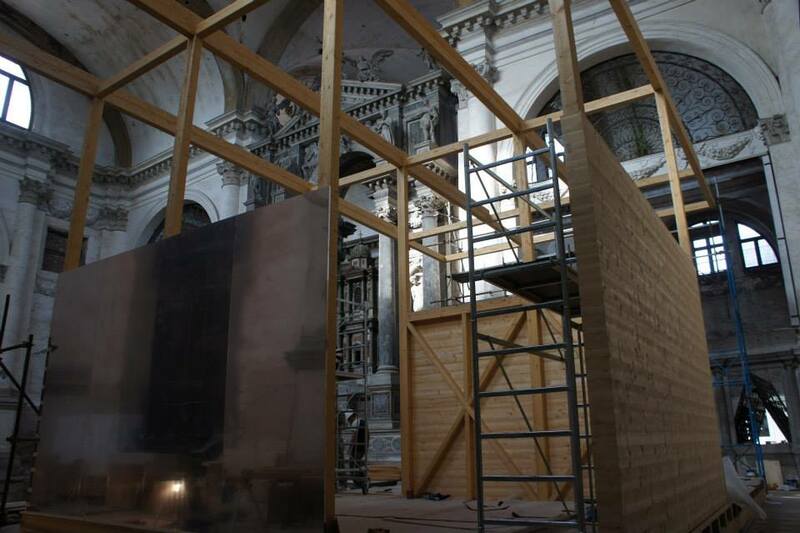 However, the curators are reconstructing the show as it was – walls, floors and artworks, ‘grafting’ the original show into the ornate interiors of the Ca’ Corner Della Regina. In addition, new documentation and archival material will be shown. More info. Two years ago, at the opening of the Biennale I briefly met a young architect from Berlin, Henning Wiethaus, at a rooftop party . It was a chance encounter that changed our lives and set in motion an incredible adventure, and we return for our anniversary as couple. So in the madness of next week, the networking, hustling and jostling, here is a little shout out to love.